SEOUL, July 16 (Yonhap) — President Lee Myung-bak donated Monday to a government campaign to raise funds to finance what are expected to be massive costs South Korea will shoulder in the event of unification with North Korea. 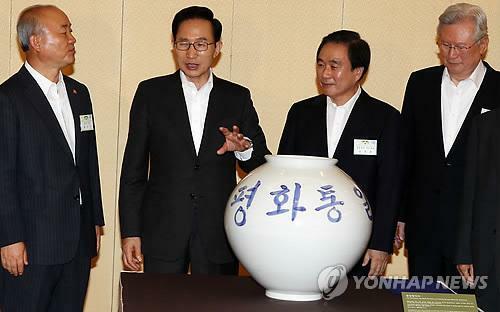 Lee put an envelope containing an unspecified amount of money into the “unification jar,” a white earthen pot the government had made in a symbolic gesture to raise money to help finance the costs of potential unification with the impoverished North. “What matters is not how much will be collected. I hope as many people as possible will take part in this and chip in,” Lee said during the donation ceremony at the presidential office. Unification Minister Yu Woo-ik told Lee former Japanese Foreign Minister Seiji Maehara had made an impromptu donation after learning of the jar’s purpose in a meeting with Yu. Maehara, a ranking lawmaker of Japan’s ruling Democratic Party, has been on a three-day visit to Seoul since Sunday. The state-run Korea Institute for National Unification has estimated the initial costs for the integration of the two Koreas could range from 55 trillion won (US$47 billion) to 249 trillion won ($216 billion). The estimate, which is projected to cover the first year of integration, was based on the assumption the two neighbors could be unified two decades from now, according to the institute. Lee has said unification could come at any time and South Korea should be prepared for it.